Explore the outer reaches of space in virtual reality. Take your place in the captain’s seat of legendary federation star ship the U.S.S. Enterprise as it descends into an uncharted region of space known only as ‘The Trench’. Your mission is simple: scout out a new home world for the scattered survivors of the Vulcan populace and a safe place to call their own. Using the incredible immersion of PlayStation VR, it’ll be up to you to take control of the bridge, commanding your tactical, helm and engineering officers as you steer the deep reaches of The Trench. You’re not alone out there though. The Klingon Empire is also known to be active in the area and their ambitions could potentially pose a threat to the entire federation. Join up to three friends online and form your own Star Fleet crew and work as a team to navigate the dynamic main story and ‘Ongoing Missions’ that procedurally generate throughout your adventure, providing new challenges and opportunities. 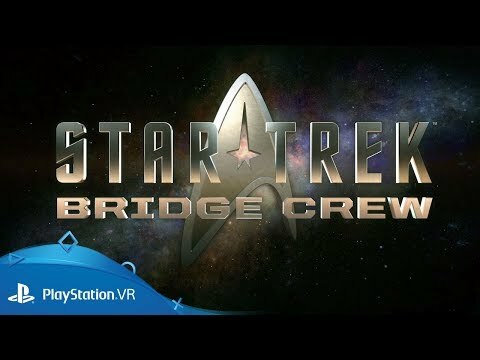 Experience sci-fi fantasy as a modern-day reality, as PlayStation VR places you directly in the captain's seat of your own Federation star ship. Take charge of your crew, make pivotal stategic decisions and chart your ongoing journey through mankind's last frontier - all as though you were sitting right there.